The civilization of “cavaliers and cotton fields” may be gone with the wind, but its fashion lives on. Young women throughout the Birmingham area have been stepping into the past for over 45 years, donning antebellum gowns for belle societies. Linda McIntosh of Hoover has been making antebellum-style gowns for the Hoover, Vestavia and Arlington Belles since her own daughter’s presentation 16 years ago. 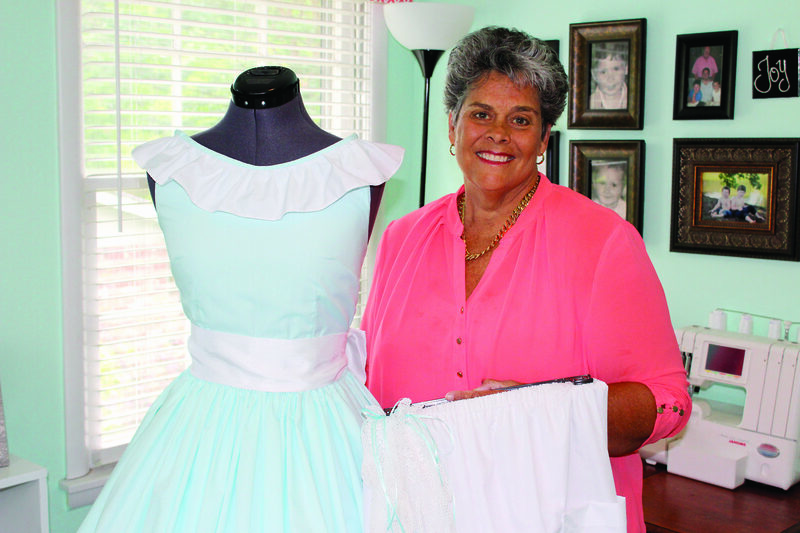 McIntosh said that most of her business is done by word-of-mouth and she spends the majority of the year sewing and making children’s clothing for family and friends. When she was a little older, McIntosh said, she began creating things and making clothes for her dolls. Though she didn’t major in fashion design in college, McIntosh said she has always loved sewing and that it’s always been a part of her life. She said she could always sew, so when her daughter was invited to become a Belle, she decided to make the antebellum dress for her daughter. “When I started having grandchildren, I sewed clothes for them, too,” she said. Compared to making children’s clothes, sewing an antebellum dress is “a bit more difficult,” McIntosh said. Antebellum dresses require multiple pieces including pantaloons, an underskirt and the dress itself. Both dress and skirt must accommodate the traditional hoop – a flexible circular structure that holds the dress away from the body, creating a bell shape. McIntosh said that during belle season she will typically spend four hours a day working on a dress, spending about 16 hours on each dress she makes. There are also strict restrictions regarding the style of the dresses. In addition, each dress must modestly cover the belle and be a pastel shade. Over the years, McIntosh has created a book that she shows to each belle who comes to her for a dress. Like the book of a wedding cake designer, her dress book is filled with pictures of the designs she has created over the past 16 years. For girls who don’t have a particular style in mind for their dresses, McIntosh said she lets them pick from various necklines, colors and laces to create their own dresses. As for the girls who already have their dream dress in mind, McIntosh said she likes for them to at least take a look at her book. Over the years, McIntosh said, there have been no big disputes over style, but some girls have asked for fabrics inappropriate for the occasion. McIntosh said that although there is no one color that looks beautiful on every belle, she has found certain shades that work well for certain hair and skin colors. McIntosh said a belle can’t go wrong with her two most popular colors. “I think the most popular one is some shade of blue or pink,” she said. McIntosh said she gets excited about belle season because of the girls who come to see her. The making of a belle dress requires several fittings, and McIntosh said she tends to have many meaningful conversations with the belles and their mothers. McIntosh is always ready to give the belles a little advice. She warns her belles not to be envious of any other girl’s dress. McIntosh said she doesn’t want her clients to get hung up on what they could have done differently when designing their dress. “I always tell them, ‘Your dress is for you, and it’s been made especially for you,’” she said.